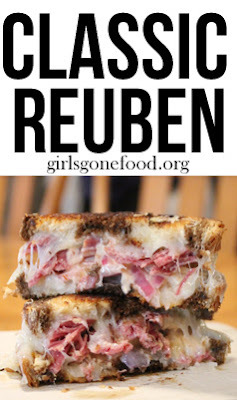 A favorite Irish dish of mine is corned beef, mostly because I love reubens. It's the combination of the buttery bread, salty corned beef, crunchy sauerkraut, creamy dressing, and melted swiss cheese that gets me every time. 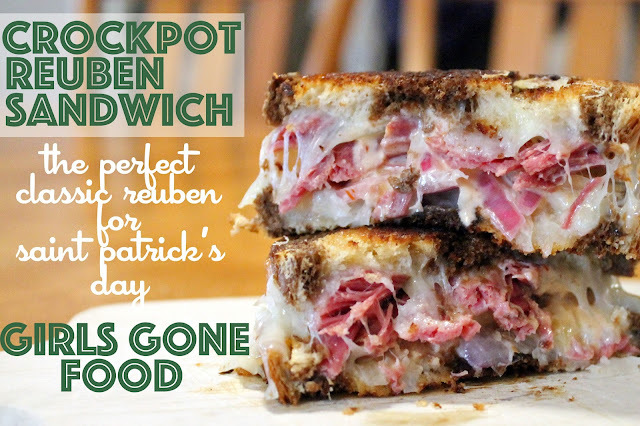 Since I can always get the perfect reuben sandwich at my local irish pub, I've never tried to make it at home before. In honor of Saint Patrick's Day this year though, I decided to give it a try. It turned out even better than I expected. The hardest part about this recipe is waiting all day for it to cook in the crockpot! Patience is certainly not one of my best qualities. I wish the picture showed a little bit more of the corned beef because it is definitely the star of the sandwich. I decided to cook it in the slow cooker so that the corned beef would be super tender. 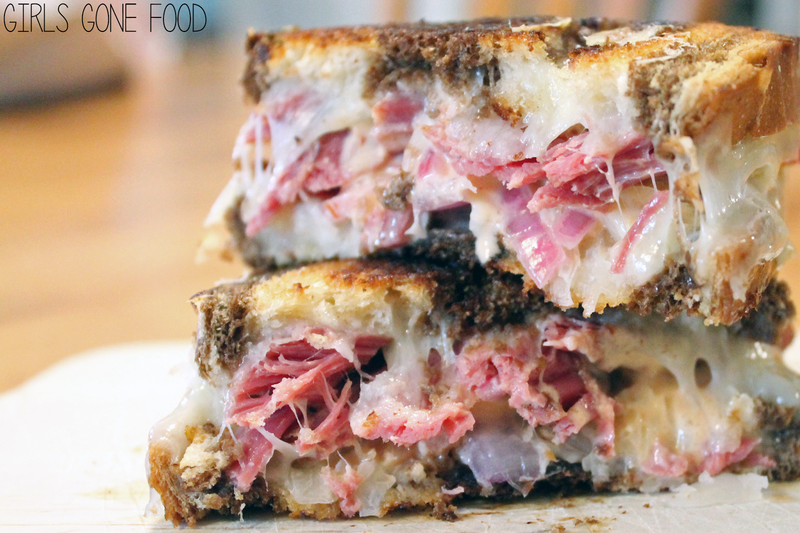 The recipe below is for a classic reuben sandwich. You'll see pickled onions in the picture too because I LOVE pickled onions and I had some extra in the fridge. If you'd like to add some pickled onions to your reuben as well, squeeze lime juice on top of thinly sliced red onions, and let it sit for a few hours ,or overnight if you can, in the fridge. Add the onions in place of the sauerkraut, or with the sauerkraut like I did! I love this slow cooker recipe because you can make so many fun dishes with the extra corned beef like irish nachos, a reuben dip, or even reuben potato skins! There are so many options! Below I included the slow cooker corned beef recipe along with how to make the classic reuben sandwich. Place beef briskets in a slow cooker with one of the spice packets (discard the other one), black peppercorns, garlic cloves, and bay leaves. Cover brisket with beer. If beer does not fully cover the top of the briskets, then add water until liquid is covering briskets. Once beef briskets are cooked, take the briskets out of slow cooker and let it rest on a cutting board. Discard the liquid in the slow cooker and cut out any excess fat from brisket. Take two slices of bread. On each slice of bread, butter one side. Place one slice of bread butter side down in a skillet on medium heat. On top of the slice of bread add one slice of swiss cheese, then sliced corned beef, then sauerkraut, then thousand island dressing. Top with a second slice of swiss cheese, then the second slice of bread butter side up. Cook for a couple minutes letting the bread on the bottom to become golden brown, then flip. Cook for another minute or two until both sides are golden brown and cheese is melted.